Baranda, J.; Henarejos, P.; Grunenberger, Y.; Najar, M.
Abstract—In this paper we present our approach regarding the implementation of new wireless radio receiver exploiting filterbank techniques, using a software-development driven approach. Since most of the common radio communications systems share a similar structure, this can be exploited creating a framework which provides a generic layout and tools to construct a reconfigurable transmitter and/or receiver. By combining the use of the Universal Software Radio Peripheral version 2 (USRP2) with a generic object-oriented framework of our own built on top of the GNU Radio software framework, we have been able to quickly implement a working proof of concept of an Uplink (UL) Filterbank Multicarrier (FBMC) receiver, both for Single- Input Single-Output (SISO) and Multiple-Input Multiple-Output (MIMO) scenario, within the project of the 7th European framework called PHYDYAS. We described here the methodology we have applied from software engineering in order to build this demonstrator, which shows the suitability of using Software Defined Radio (SDR) technologies for fast prototyping of new wireless communication systems. Baranda, J. [et al.]. Prototyping with SDR: a quick way to play with next-gen communications systems. A: IEEE International Symposium on Wireless Communication Systems. 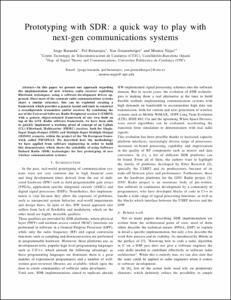 "Proceedings of the International Symposium on Wireless Communication Systems". 2011, p. 16-20.